link to pics and vid here. "Too bad that VPairsoft 11.1v 1300Mah isnt sold in America its seems to help the sloppy trigger response and stops the gears from not completing a full cycle or the 25C output atleast helps"
C alone means nothing and citing it as a factor that "helps" in some manner or another is meaningless unless you have the mah (which you do list). Also applies to packs made up of other chemistries. For all practial purpose the VPAirsoft pack is no different from other 3S Lipo packs, other than sizing. That is a pretty old pack. Going on 8 years old. Many newer packs in higher capacity in the same size have come out. Can you give a list that can fit a vector with same spec on the video (1500mah, 3s, 11.1v, 20-40c). High Capacity Packs or just something that fits? Good price or any price? Same spec on the video or higher: 1500mah, 3s, 11.1v, 20-40c. Price is not an issue. It should fit vector battery compartment. Found some 3S 1400mah that will fit in Vector. Anyone need some? 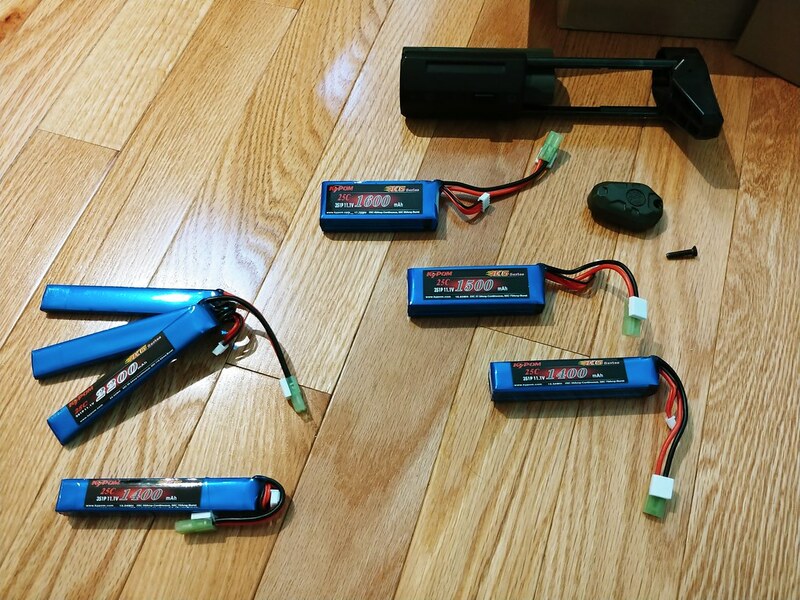 The 3 11.1V LIPO's on the right will fit the PDW Buffer. The 1600 is snug...but it fits. This pack works well, just make sure to shorten the connector down like in the above video. Fair warning, 2-round will become 3-round on stock setup.